— Stanley Fisher, “Privatization in Eastern European Transformation,” in The Emergence of Market Economies in Eastern Europe, Christopher Clague and Gordon C. Rausser, eds. (1992), p 230-231. Economic stabilization, law and order, food, medicines, the establishment of workable institutions and organizations for policy implementation, the establishment of clear, secure and marketable property rights, national reconciliation and social peace will be critical to Cuba’s reconstruction and transition to a truly open economic and political system, and for that country to rejoin the international financial community. While there is almost general agreement on the need to privatize state-owned enterprises and attract foreign investment to Cuba as rapidly as possible, there must first be a determination regarding the issue of property rights. Changes in property rights must be entrusted to institutions that themselves neither exercise property rights nor enforce them. Moreover, unless clear and transparent “rules of the game” are set and implemented, the amount and quality of investment taking place will be less than what is needed to put Cuba on a sustainable and high growth rate. In this paper we explore some basic issues. We do not intend to be exhaustive, but only illustrative of the complexity of the issues. We hope we can learn from the experiences of former socialist countries, so as to increase our understanding of these issues and avoid recommending policies that would lead to costly mistakes. Following this introduction, we present rough estimates of the breadth and depth of property confiscations in Cuba and the complications created by the foreign investment since 1990 and by the cooperativization of agricultural state enterprises in 1993. The next section includes a presentation of the Eastern European, Nicaraguan and Chilean experiences and some of their lessons for Cuba. Also some considerations will be made regarding restitution. This is followed by presents an overall appraisal of the potential package of measures that might be adopted and will conclude with some specific recommendations to tackle compensations for property confiscations and tort claims. From our examination of several of these claims, at least some of the FCSC’s awards are open to question. In the early 1970’s, the Internal Revenue Service established a program under which taxpayers were entitled to deduct from their income taxes losses sustained from confiscations by the government of Cuba. If claims awarded were inflated to a value of twice the actual loss, at a marginal tax rate of 52 percent the tax benefit would roughly compensate entirely for the loss. As a matter of interest, official U.S. Government statistics place the total value of U.S. investment in Cuba at US$956 million. 5 While this figure may represent book value of investment, the significant discrepancy between this figure and the total of corporate awards serves to highlight the need for careful review of the FCSC’s awards. The IRS program mentioned in the preceding section was extended specifically to Cuban nationals at the time of confiscation losses and were now U.S. taxpayers. Unfortunately the authors have not been able to obtain any information regarding the total amount accepted by the IRS as loss deductions. In 1994, a group of Cuban-Americans sent a document to Secretary of State Warren Christopher requesting that the Department’s Office of International Claims and Investment Disputes (OICAID) take up their claims even though they were not U.S. citizens at the time of confiscation. In doing so, they cited precedents such as the Bernstein case (210 F.2d 375, 1954) and the “Second Italian Claims Program.” 7 This was reflected in the initial provisions of the “Helms-Burton” bill considered by Congress in 1995.
though the government of Cuba has not been able to comply with the agreed amortization schedule. According to the Cuban Chamber of Commerce, as of July 1994 there were 146 joint ventures operating in four main sectors: industry, tourism, mining/oil and telecommunications. Several of these companies, however, have two or more separate joint ventures in Cuba. Carlos Lage declared that as of November 1994, there were 105 joint ventures with different companies. Most of the joint ventures are with Canadian, Mexican and European companies, particularly Spanish, French and Italian. Also, there were approximately 400 companies with representatives and/or offices in Cuba, among them Bayer, Castrol, Hoechst, Pegaso, Sandoz and Total as of November 1994. All investment in Cuba is in the form of joint ventures with the Cuban government or with a Cuban state company. The Cuban side contributes the fixed assets and the foreign partner the working capital, the technical expertise and access to external markets. Sometimes the foreign partner merely supplies management. According to Lage the estimated accumulated foreign investment at the end of 1994 would have reached US$1,500 million. In 1993 most of state-owned farms were transformed into basic units for cooperative production (UBPC) (Decree-Law No. 142 of September 15, 1993). UBPC can lease land and animals from the state for an indefinite period of time and retain part of their profits for reinvestment purposes. UBPCs organize themselves and select their own leadership. UBPC start the demise of state and collective farms, can lay off inefficient workers and cut back excess personnel. According to preliminary figures, with the establishment of the UBPC, the state sector’s share of total agriculture felt from 75 percent to 34 percent while its share of cultivated land felt from 80 percent to 25 percent. This is a striking and significant change in land tenancy in Cuba, because the UBPC are de facto “owners” of the farms. These “stakeholders” have existing ownership rights, in the sense of being able to exercise control over assets effectively. Moreover, it is likely that these stakeholders will take both economic and political action to defend their rights. Unless these stakeholders are somehow appeased, bribed or disenfranchised, the privatization of UBPC’s cannot proceed or there will be “pseudo-privatization” (the transfer or “give-away” of public assets to private owners without an exchange of financial resources, skills and technological expertise). Obviously, the property rights issue is primarily a political issue, not a technical or economic one. In the final analysis, any solution should have the support of the majority of the Cuban people in order for the solutions to be enforceable, the outcome peaceful and also to encourage the proper and speedy reconstruction of the Cuban economy. Swift creation of a legal framework that defines property rights clearly facilitates public understanding of privatization, stimulates broad-based ownership, prevents abuse of power, and speeds up privatization and foreign investment. Ronald Coase (1960) and Olivier Williamson (1985) argued that once property rights are well-defined, individuals have very strong incentives and face reduced risks to work for efficient outcomes, but these outcomes will be independent of the allocation of those property rights. Some of these goals are not necessarily independent of each other nor mutually compatible. From the very inception of transition policies, the clear delineation of private property rights and the fast reestablishment of private property from the inherited all-but-exclusive state ownership have been core tenets in the political debates of how best to forge ahead. A sociopolitical consensus on restituting property that was earlier confiscated, as one notable wrong to be righted, first emerged in Czechoslovakia after the “velvet revolution” as early as October, 1990. Generally speaking, the Eastern European and Baltic countries, as well as Nicaragua, made a strong commitment to undo injustices of the past. The privatization programs of these countries address the issue of restitution of property based on their specific economic, political and social conditions, setting different time limits for claims and offering different remedies according to their reality (restitution, compensation or other). In some countries the relevant legislative work is still incomplete. As indicated in Tables 2 and 3, restitution is now on the policy and privatization agenda in these countries, at least for some classes of assets and is being resolved in different ways in each country. Certainly, the measures embraced are anything but uniform. At the start it is necessary to decide how far back a country should redress injustice and what types of grievances should be considered. Evidently, violations of personal rights and freedoms in general and unjust and illegal confiscations of property in particular did not start with the communist takeover and did not necessarily end after the communist governments were established. Arbitrary and capricious violations of basic rights and freedoms, confiscations of different types of property, pensions and the fruits of labor have been a endless practice during the communist governments. Some of the people whose properties were confiscated received at least partial compensation. Some properties were obtained initially through misconduct or wrongdoing. Some of the properties were abandoned or the owners were out of the countries with no intention of returning. There were title and tax disputes at the time of the confiscations. Another critical issue is defining citizenship for the purpose of restitution laws. Most countries have defined that only those individuals who were citizens of the country and who had lived there permanently when the law came into effect are eligible for restitution, especially for agricultural and forestry lands. Also, most countries do not espouse claims against foreign governments brought by persons who were not their own citizens at the time of the confiscation. The new commitment to democratic values and respect for the rule of law in Nicaragua and in the Eastern European and Baltic countries argues in favor of restitution or compensation for moral and ethical reasons. But, it has been argued that restitution or compensation also belong to the fundamentals, not only as a matter of justice, but also as a technical precondition for individual, collective and social stability, domestic capital formation and the influx of foreign capital. However, there are numerous legal, moral, economic, and technical objections that seriously call into question its feasibility. Secure, clear and marketable property rights are key to the private sector’s ability to respond to the changing economic environment. Privatization sales cannot start as long as the ownership of a given asset is under dispute. Few people are willing to invest, given the threat that the assets might be claimed by a former owner. The greater the risks they perceive, the less they will be willing to bid for the assets. What makes matters worse is that some of those willing to invest may lack access to credit, since the absence of a title makes it impossible for banks and other financial intermediaries to accept the assets as collateral. Also, demarcated and unambiguous adjudication of property rights and an environment conductive to enforce them in law are a necessary prelude to the establishment of a market economy and for attracting foreign investment. However, the settlement of property rights is an issue of political economy (or normative economics) par excellence rather than exclusively a technical one. While restitution may be justified on moral and ethical grounds, it implicitly favors people who used to posses physical assets over those who used to possess financial assets, rights, valid contracts or human capital and it is quite complicated to implement. Especially problematic in this context has been the question of agricultural land ownership. Yet rapid progress is urgent, for without it there will be no stimulus to increase output generation from the farm sector. Similar issues arise in connection with nonagricultural land and housing. Some countries, such as Germany and Bulgaria, use extensive in-kind restitution as an integral part of their privatization programs. Others such as Hungary have chosen a moderate financial compensation over a direct return of physical assets in order that restitutions, which have become a transformation trap or long detour in Germany, do not muddle and delay the transformation of these societies into market entities in general and the privatization process in particular. In Germany, where large parts of all land and buildings are subject to restitution claims, the issue of restitution has tended to obscure fundamental property rights, slow the process of privatization and give disincentives to potential investors. As a result, the Treuhandanstalt, the German privatization agency, was authorized to use financial compensation instead of in-kind restitution when it deemed this solution to be indicated by overriding public interest. In Bulgaria, Estonia, Latvia and Lithuania there is a clear danger that restitution questions will further delay privatization and foreign investment. In Hungary, where the government decided to compensate rather than to restitute, the problem has been solved by offering compensation in the form of property vouchers that can only be used for certain purposes such as buying stocks or acquiring land, apartments, or commercial properties. 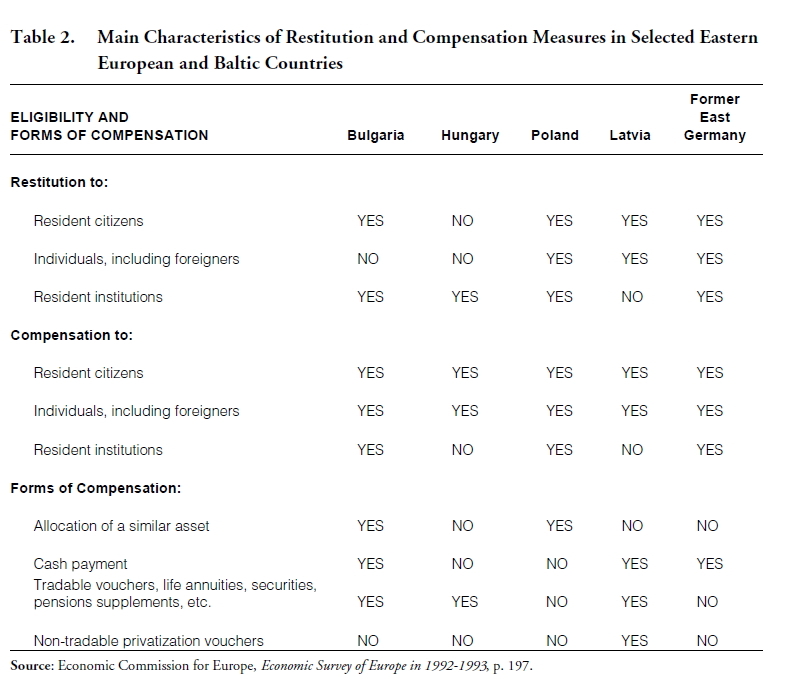 In general, most of the Eastern European and Baltic countries have favored less extensive restitution or financial compensation than Germany or Bulgaria. In Chile, the military government reduced the total number of enterprises under state control from 529 in 1973 to 47 in 1983. It began through the restitution of the seized enterprises to their original owners. The process was conducted quite rapidly; by the end of 1974, 202 had already been returned, and by 1978 only 2 had not been returned. Likewise, the government decided to regularized the situation of seized farms, to terminate the agrarian reform program, under which approximately 52 percent of agricultural land had been expropriated, and to privatize the legally expropriated land under state ownership. This process was practically completed by 1979. Of the expropriated land, 30 percent had been returned to the original owners; 44 percent allotted or sold to private owners, mainly individual families and cooperatives; and 18 percent transferred to nonprofit institutions. Of the land returned, the former owners had to renounce any legal action they may have been entitled to against the state. The shares of some enterprises were also used as payment to settle legal actions taken against the state by former farm owners who used when their land was expropriated in the agrarian land reform of the early 1970’s. In Nicaragua, about 200,000 petitions regarding the violation of property rights encompassing about 1.7 million hectares of a total of 5.7 million hectares of cultivated land and for a substantial number of houses and urban lots were presented to the Attorney General between 1990 and 1993. The agrarian reform affected about 36 percent of the total land of the country. The lack of clear ownership has encouraged land invasions and violent confrontations that have been met with a weak response from law enforcement agencies. It can take the government up to 90 days to carry out evictions, by which time the intruders have caused severe damage to property. The uncertainty created by these unresolved property conflicts and resulting climate of violence arguably constitutes the single most important obstacle to increased private investment and productivity in agriculture, and in turn negatively affects the rest of the economy. The Nicaraguan government devised a compensation scheme based on cadastral value for those whose property was unjustly expropriated or confiscated but who cannot recover the property. Transfers based on the agrarian reform laws have in general been considered legal. The compensation will be in bonds with a 20-year maturity at an annual interest rate of 3 percent (indexed to the US dollar exchange rate) that can either be kept to maturity or used to buy public assets. In general, the cadastre value of the property is less, and sometimes substantially less, than their market value. In most countries budget deficits appear to determine the lack of feasibility of direct, prompt, adequate and effective cash or other monetary compensation. The only feasible compensation is a present good-faith gesture, together with future rights and obligations that stimulate the economic growth of the country and create future ability to pay. In some countries the government has limited restitution by imposing a strict deadline for filing claims and by restricting the amount of restitution. 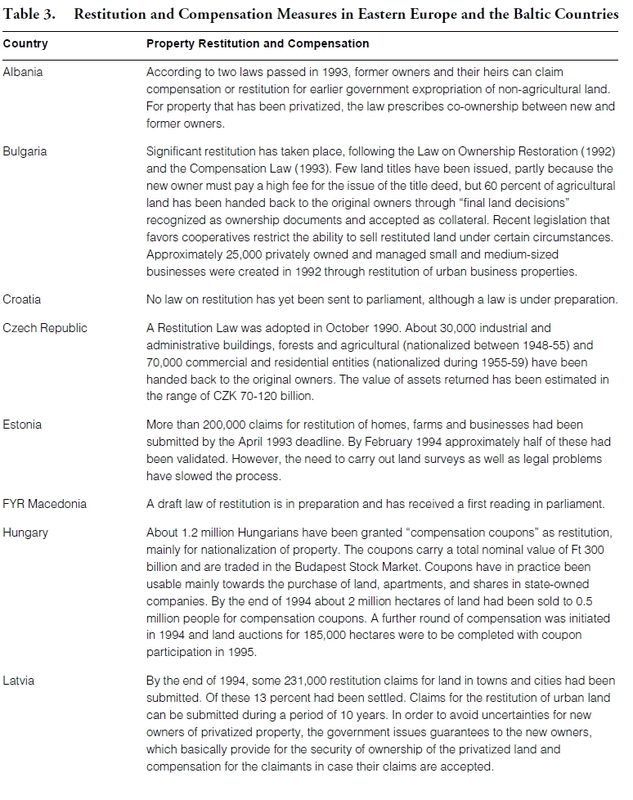 In Germany, Czechoslovakia, and Hungary the restitution claims numbered in millions, most of which have not been settled. In Nicaragua the restitution/ compensation issue has polarized society, created frictions between the Nicaraguan and the US governments, divided the Sandinistas and “it is the core issue holding this country back.” 9 These difficulties have raised the political stakes for governments and caused logjams in administration and in the courts. Also, the expectation of engineering quick changes in property rights were frustrated in a matter of a few months. It has been this potential problem that has been slowing down the process of privatization notably in Germany. Radical policy measures were adopted in early 1991 that sought to replace the right to restitution with a right to compensation, guaranteed by the German government, in cases where the contested property could be put into productive use by a potential buyer making a commitment to invest in the asset that was the object of contention. One of the fundamental implementation problems that arises with restitution can be summarized as follows. Even if the former rightful owners or their rightful heirs can be clearly identified, which is usually a very complex and demanding task, where justice lies is by no means self-evident if, after so many years, restitution of property requires an immediate declaration that all confiscations are declared null and void. This creates dislocation and pain from the revocation of the usufruct of property that was entrusted to others, or of clear property rights that were acquired by others according to existing law. At least in some countries, there have been significant investments by management and/or workers who had some authority over the usufruct of assets. Moreover, the essence of the confiscated property rights can no longer be separated from presently existing property rights, however inadequately they may have been defined and monitored under central planning. Thus resorting to restitution generates enormous difficulties. One of the greatest problems facing any but the narrowest form of restitutio in integrum — for example, the return of confiscated paintings or sculptures now in museums or book manuscripts or collections in libraries to original owners— is that the legal professionals and infrastructure in the transformation economies, already inadequate at the inception of the process, is likely to get hopelessly entangled in an endless tide of grievances, claims and litigation for years to come. Forging ahead with divestment in the absence of clear titles will likely embroil the divestment agency with crippling long-term claims and litigation. Gerd Schwartz, “Privatization in Eastern European Countries,” in Transition to Market, Vito Tanzi, ed., (Washington, D.C.: International Monetary Fund, 1993) p.
claims against physical property over those claiming civil damages such as those suggested above. In at least one case, that of Jenny M. Fuller, et. al. (Decision CU-6199), the FCSC made an award based on what it considered to be wrongful death, because it felt that Cuban authorities had discriminated against two U.S. citizens in executing them although they had admitted guilt to armed uprising. Loss of pension benefits were also allowed by the FCSC. D. Restitution: A Long Detour or a Transformation Trap? Juan C. Consuegra-Barquín, “Cuba’s Residential Property Ownership Dilemma: A Human Rights Issue Under International Law,” in Rutgers Law Review, Winter 1994, 923. Property rights were protected against confiscation by the Cuban Constitution of 1940; they should therefore be returned to their rightful owners. 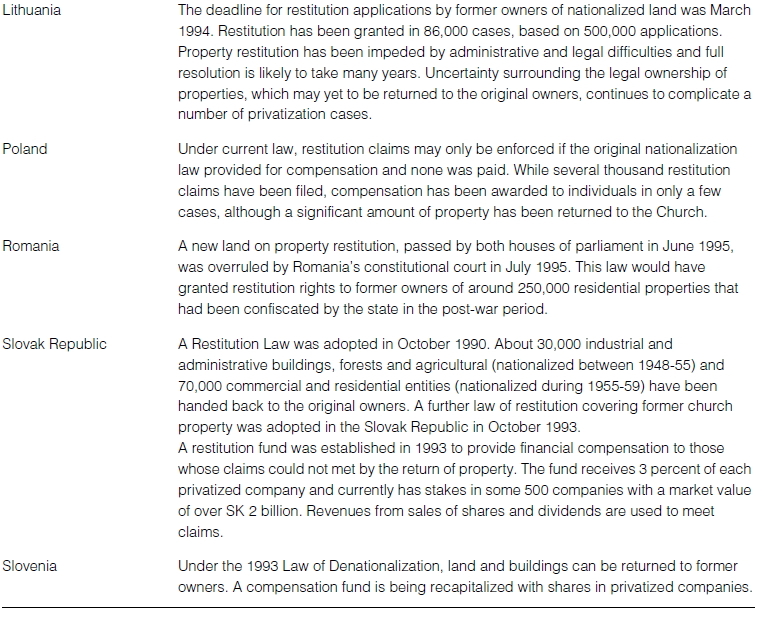 Other formerly socialist countries (Eastern Europe, Nicaragua) have implemented restitution policies. Fortunately, most Cuban expatriate groups have recognized that restitution of dwellings or residential property is not advisable. The discussion can then be restricted to non-residential property. The issue of modifications to property making restitution impractical is not trivial. 17 As a result of modifications, some former owners would receive nothing while others could receive more than they lost. In the case of small business owners (there were 855 corporate awards totaling US$123.3 million), the likelihood of physical disappearance and/or substantial modification is extremely high. Returning these properties, ipso facto, to U.S. ownership, even if it were feasible to do so, would be tantamount to insisting that nationalistic feelings in Cuba due to foreign ownership of the country’s principal assets never had a basis in fact. Moreover, it would tend to lock the country back into a sugar-dominated structure of production, precisely at a time when an unintended benefit of Cuba’s economic collapse is having the opportunity to diversify away from this declining industry. In the case of public utilities, the value of a concession to provide electric power or telephone service to a country of 11 million is significantly greater than for a country of 6.5 million, which Cuba was in 1959. 19 We consider that Cuba must have a very competitive, dynamic and exportoriented economy at the time of NAFTA and the WTO and such monopolistic concessions would be incompatible with this objective. Thirdly, the output and employment benefits that have been estimated by some researchers 20 are based largely on unrealistically positive assumptions regarding its feasibility and insufficient consideration of the benefits of alternatives to restitution. Large enterprises can be privatized by two modes: (i) the free distribution of assets to the public at large and (ii) following a case-by case commercial approach with four main variants: (a) sale of a controlling percentage of share to a private company; (b) initial public offering of shares on a stock exchange, either domestic or international; (c) employee or management buyout; and (d) liquidation of the enterprise and sale of its assets. In the free distribution of assets, while managers are liberated from government supervision, they are not put under the control of the new owners. Effective controls can be imposed gradually, no matter how fast the formal rights are distributed. Under the second mode, when a state enterprise is sold to new owners, corporate governance is immediately established, the necessary adjustments begin to follow and additional financing is often forthcoming. However, the mode proceeds case by case, it take a long time to privatize a majority of state firms. Therefore the dilemma is to choose between a wide and shallow privatization or a deep and narrow one. As pointed out above, to be fair to all parties any consideration of compensation for property loss in Cuba must be matched by arrangements to compensate for tort claims. A commitment to compensate those whose assets were earlier confiscated is easier. It encompasses a tabula rasa approach, that is, mandates forging restitution and limiting to compensation the claims of economic agents whose property had earlier been confiscated. Swift economic progress in this environment is a distinctive possibility. Of course, compensation presents some complexities too. It could put pressure on current or future government budgets and assessing the property of claims would still have to be tackled. Ascertaining values of confiscated property is a hazardous undertaking under the best of circumstances. This is even true when the object of assessment is being narrowed down to real estate, plant and equipment. Some of them have changed to such an extent in the intervening years that fair compensation is fundamentally an impractical choice, some of them are in a physically dilapidated shape, and it is unfair to ignore many other assets such as goodwill, technologies, contracts, rights, licenses and patents, financial instruments, market position and human capital. Aside from generating much work for accounting firms and lawyers, at the great expense, in the end, to the taxpayer in the countries in transformation, such cumbersome, costly evaluations are in any case rather meaningless in the disorderly, highly inflationary and increasingly competitive environment of the countries going through the transformation. There is also the problem of the introduction of modern tax systems and accounting procedures. Any attempt to ask a new Cuban government to compensate former rightful owners in cash or cash equivalent out of general revenues must be considered dangerous, given the already exceedingly weak fiscal base of the economy. Perhaps a commitment in principle to compensate former rightful owners from the proceeds of the sale of capital assets, including the transfer of shares in state firms to be privatized if so desired, or providing future rights and preferences would go a long way to see justice done without disrupting the transformation process. There are two U.S. laws related to compensation for U.S. claims that are critical to Cuba’s reconstruction. One bans aid to countries that confiscated property owned by U.S. citizens without equitable compensation and the other requires the U.S. to vote against aid by multilateral lending institutions to such countries. Hence, U.S. laws require resolution of U.S. citizens’ confiscation claims before foreign aid can resume. Bilateral negotiations are desirable to resolve U.S. claims. We would argue that by the act of filing claims before the FCSC, U.S. citizens and corporations formally requested the U.S. government to demand compensation, and the U.S. government did so by first placing and then maintaining an embargo on trade with Cuba. Furthermore, the U.S. government paid at least partial compensation to claimants through the tax system. As mentioned in preceding sections of this paper, in the early 1970’s, the Internal Revenue Service implemented a program allowing individual and corporate taxpayers (i.e., including Cuban expatriates who were taxpayers and suffered losses) to take federal income tax deductions for losses of property confiscated by the government of Cuba (see Appendix). Those who filed tax returns claiming deductions for losses also transferred their claims to the U.S. government. Groups of Cuban-Americans have also formally requested the Secretary of State to take up their cases. Therefore, all U.S. claimants (citizen and non-citizen taxpayers) made their claims subject to international negotiation and, if the doctrine of espousal is invoked (as it should be), must abide by the settlement made by the U.S. government. Rather than negotiating with each claimant, the government of Cuba should indicate its readiness to negotiate this matter bilaterally with the U.S. government. The purpose of massive privatization is to provide Cuba a realistic change for a fresh start as a market economy and representative democracy because Cuba faces a solvency problem and not a liquidity problem. Only interest payments on foreign loans could swallow about half of Cuba’s export earnings. All compensation claims for confiscations of property and other torts must be reduced or postponed, and emergency and development economic assistance must be provided expeditiously in order that comprehensive and difficult transformation reforms are implemented and have time to take hold. An analogy to U.S. bankruptcy proceedings is pertinent here. When an enterprise works its way through a Chapter 11 bankruptcy in the United States, three things normally happen. First, creditors are forced to refrain of pressing their claims. This breathing space, or financial standstill, provides the debtor the chance to get back on its feet. Second, the debtor may be allowed to borrow fresh funds on a privileged basis to replenish its working capital and the new creditors have higher priority than the old ones. Third, the old creditors are usually compelled to cut a deal with the debtor, in which they cancel or restructure part of the debt or convert part of it to equity, to allow the debtor to emerge from bankruptcy with an opportunity for continued operations. This is the type of scenario that will have to take place in relation to Cuba’s serious financial obligations if the country is to get back on its feet. However, an important issue to be considered is the negative impact a no-compensation policy might have on the government’s credibility in reestablishing private property rights. It is also felt that future investment will be discouraged unless there is some form of official recognition of past losses, for which special consideration might be given during the process of privatization. In a previous paper, we suggested the corporatization of certain large military bases in Cuba and their conversion to free trade zones, with labor being provided by the deactivated military. In a NAFTA and WTO world, free trade zones may be less attractive possibilities. Nevertheless, as an example of one possible means of compensation, a scheme might be built into the corporatization of military bases, converting them into poles for industrial development, and compensating with shares in these corporations. In this regard, the government of Cuba could negotiate the earlier termination of U.S. rights to Guantánamo Bay, with its airport, port, structures and other facilities covering 117 Km2 and occupying one of the three best Cuban ports, establish the Guantánamo Development Corporation, and use shares or profits from that corporation to compensate the government of the United States for U.S. claims. Obviously, there is no reasonable way for a future government of Cuba to justify compensating the U.S. and not its own citizens. Compensation of Cuban and other claimants who did not receive tax benefits from the U.S. could take the form of issuance of shares or discount coupons to be used to purchase shares in selected corporations. Reaffirm at the outset that all non-residential property in Cuba belongs to the state. Declare its recognition that confiscations of properties that took place after January 1, 1959 were illegal, except properties initially obtained through misconduct or wrongdoing, and its intention to negotiate settlement of the claims. Declare its willingness to enter into negotiations with the Government of the United States for direct bilateral settlement of the debt owed for properties of U.S. citizens confiscated after January 1, 1959. This debt includes (a) claims presented to the U.S. Foreign Claims Settlement Commission and found to merit awards, and (b) assets claimed as losses to the Internal Revenue Service by U.S. citizens and former Cuban nationals. Lifting of the U.S. embargo is a necessary though not sufficient condition for Cuba to have the ability to service its obligations, apply for debt rescheduling and debt relief, and have access to fresh credit. In our view, as a result of the combination of the Foreign Assistance Act of 1961 and the Cuban Democracy Act of 1992, only a transition government of Cuba, committed to holding free and fair elections, will be able to negotiate the issue of U.S. claims with the government of the United States in order to resolve this matter. Since the lifting of the U.S. embargo is a priority, Cuba must indicate its agreement to enter into formal bilateral (government-to-government) good faith negotiations regarding U.S. claims, but the embargo must be lifted prior to concluding the negotiations. Some have indicated disingenuously that lifting the embargo prior to settling all claims would “compromise the entire U.S. Cuba claims issue” and that the United States “would lose any leverage it may otherwise have had with regard to the prompt resolution of the U.S. Cuba claims matter.” 22 This argument seems to us absurd, since Cuba’s development hopes and ability to compensate are inextricably tied to its relations with the United States. The challenge for both the U.S. and Cuba will be to build a relationship based on mutual respect and trust. Establish the Guantánamo Development Corporation (GDC), as a Cuban corporation, on the property to be vacated by the U.S. Naval Base on the basis of an agreement as part of Point (3), as an industrial development zone. The government of Cuba would retain a minimum of 25 percent of its shares, the remainder to be distributed by the government of the United States as further compensation for losses sustained by its citizens and former Cuban nationals who claimed losses to the Internal Revenue Service. Suitable agreement should be reached to safeguard the value of the GDC’s shares in order for compensation to be meaningful. Select major military bases with good infrastructure (especially port access) and establish one other industrial development corporations modelled after the GDC. 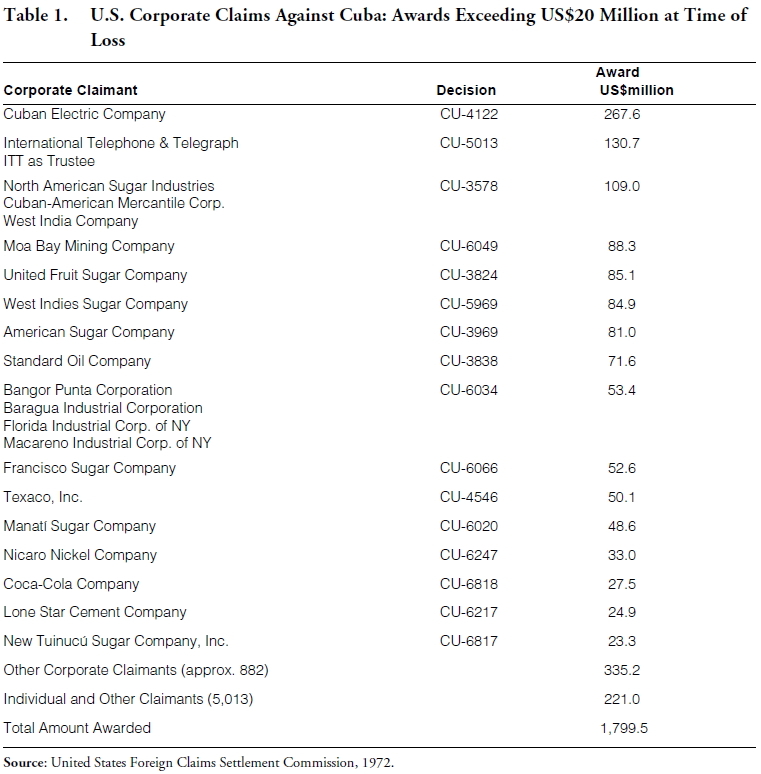 Shares in these corporations would be used to compensate claims awarded by the CACUCOCO. Implement a privatization program for the non-residential properties specified in Point 1 above, providing for swift distribution of small and medium state enterprises and giving priority to Cuban resi 24 Privatization should be carried out with absolute transparency and without any suspicion of impropriety. This will provide robust political foundations to the economic transformation. Adopt a modern foreign investment law, join the Multilateral Investment Guarantee Agency (MIGA), and invite and sign agreements with the Overseas Private Investment Corporation (OPIC) and other similar European organizations to begin financing and insuring investments in order to reduce the country risk of investing in Cuba should also sign the International Convention for the Settlement of Investment Disputes (ICSD) and enter negotiations with the aim of securing bilateral investment agreements to avoid double taxation in order that foreign investors can receive credit for the taxes they pay in Cuba from taxes payable in their country of origin.